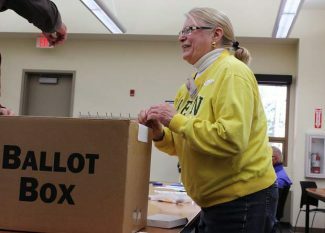 Grass Valley resident Kathryn Davis called Baird an active Tea Party representative, and having run as a Democrat in this election cycle was acting as a spoiler in the special election for the Senate seat. 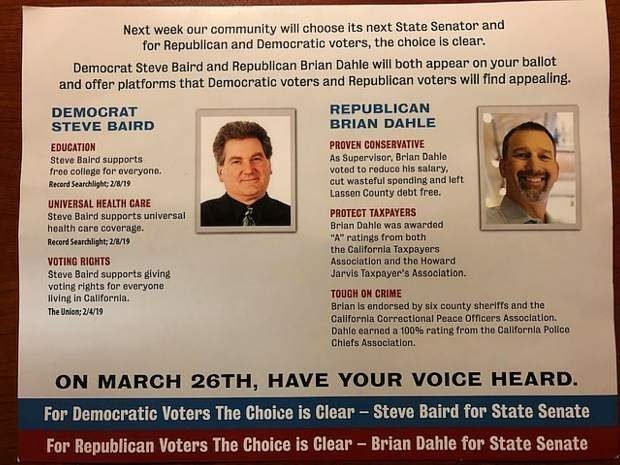 In his previous run for state Senate, Baird said he would be considered a “climate change denier,” noting he believes reports of climate change both in the government and the media are based on “false science,” and that the earth has historically cycled between warmer and colder periods. 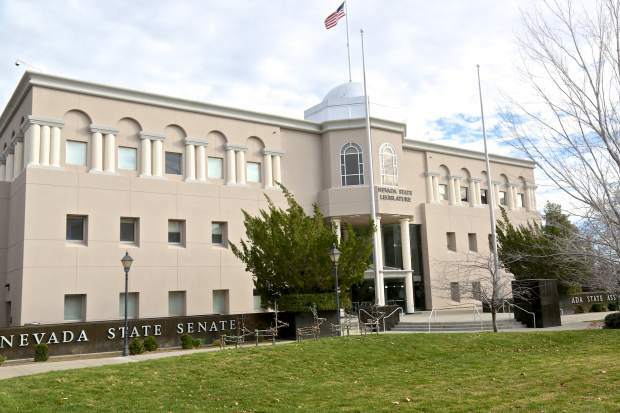 At an April 2016 candidate forum, he told Nevada County voters that legislation creating the State of Jefferson, breaking off a portion of Northern California as a 51st state, would be among the first bills he’d attempt to pass, if elected. 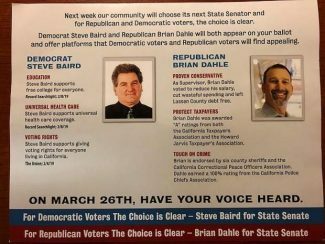 According to the Secretary of State’s office, the committee “Dahle for Senate 2019, Sponsored by the California Correctional Peace Officers Association; Taxfighters for Brian” has received $299,000 in contributions during the Jan. 1-March 9 filing period. Of that, $150,000 came from the California Real Estate Independent Expenditure Committee of the California Association of Realtors. 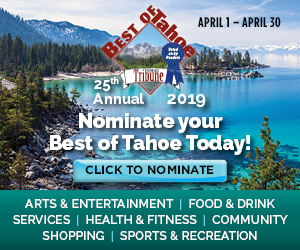 The Taxfighters committee spent $208,365.47 during the period, of which $125,151.33 was paid to “Misfit” for radio, television and website work, according to campaign filings.